Versioning in EPiserver for media content is supported and is a great feature. In CMS version 10 & 10.1 unfortunately due to a bug, the media items become inaccessible if republished the older version of the content. 1- Upload a pdf or image file in media folder though EPiServer CMS edit. 2- Upload another version of the file, the EPiServer ask to Replace file or Skip .. choose to replace. 4- Go back to/ select old version of the file and republish it. 5- the file is inaccessible. 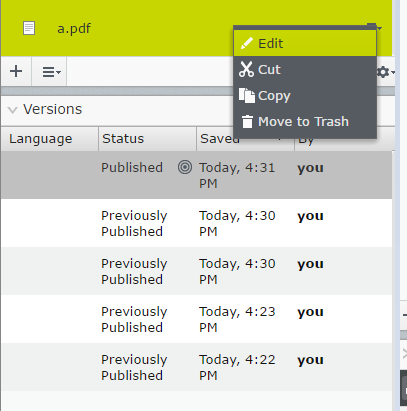 As shown in the screenshot below taken from CMS version 10, the download option is disappeared and in 10.0.1 the download option becomes grayed out. No matter what I do now, I can't bring the links and versions back to life unless I upload the file with different name. As shown in the screenshot below the physical files exists in the Assets folder and I can open them without any problem. I tested the above scenario on EPiServer CMS 9.1 and 9.7 sites and it works perfectly. So I came to the conclusion that it’s a bug in EPiServer CMS 10 and I reported to EPiServer support. Episerver Support provided me with the following SQL script for the bug fix and it's been later fixed in the next released version of EPiServer. As always it is recommended to make a backup of the database before applying any scripts.